As the joins are an 'OR' is doen't matter the actual order of the fields searched. Note that you can't alter the type of match (the operator) - they are always "starts with" or "contains". The QF Preferences pane only list those fields against which QF can match; in effect this means only string-type fields, string/text-block/URL, whether they are built-in or custom. Any QF preference changes, e.g. 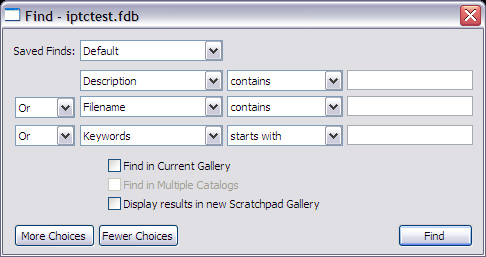 adding Custom Field selections, are stored per Catalogue allowing different QF settings in each Catalogue if required. As a result, this tab is missing from the Preferences dialog if it is opened when no Catalogues are currently open. This also means that if you require every Catalogue to have the same customisation, this must be manually set up in each Catalogue. However, these customisation settings are stored locally on your PC/Mac outside the Catalogue FDB file so are not moved around with the Catalogue. Thus, if userA has two Catalogues and customizes the QF of catalogue #1 but not #2 they will respond differently to words typed in the toolbar QF box. If userA then shares or sends the two Catalogues with userB, userB will see both Catalogues exhibit default settings. Why? Because the customisation of Catalogue #1 is stored outside the Catalogue in userA's computer. Confusing! If userB wants to have #1 behave as it did for userA, then userB must recreate the customisation all over again. QuickFind has a inconsistent behaviour in different versions. The OSX client v6.1.x executes a 'starts with' Find instead of the manual's published 'contains' Find. The Windows and OS9 clients perform the correct 'contains' Find. There is one odd side effect, that might be part of the previous issue, if QF targets any fields which have enforced use of a pre-defined value list (PDL). In such cases, a QF against a partial string for that field will fail, e.g. putting "John" expecting to match PDL item "John Smith". This is because the QF matching logic assumes your input to the QF box is constrained similarly to the Find dialog's value box where a mandatory MKL/PDL only allows you to pick (whole) strings from a list. None too intuitive! This list is cleared when the application is closed. Calling Portfolio with no word causes a 'Find All' action. If a QF search using a value finds nothing, run it again and instead of the current gallery being used as scope as in the first call, the second call searches the whole catalogue. Neat!